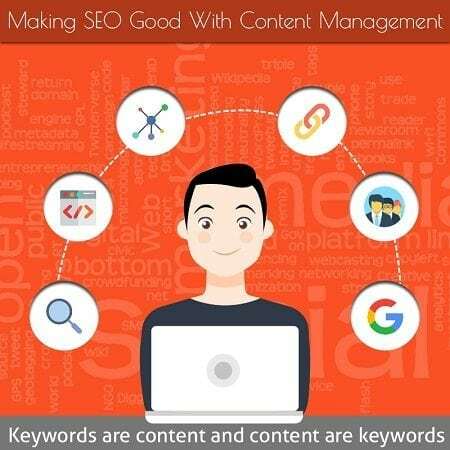 Nowadays your SEO success will depend greatly on content management. Content is indeed king for now and the foreseeable future. That being said it’s a good idea to look at the ways you can boost and maintain your SEO success with content management. The first thing to successful content management is in either creating or acquiring the kind of content people are looking for. This doesn’t mean you copy every popular trend there is, but you not only focus on the latest trends and keyword research but that your specific site content creates an impact on whatever industry or niche that you’re part of. This means if you can’t create engaging content then you had better hire someone to like an SEO expert. If people are searching for you and your goods and services, your site has to not only attract their attention but retain it. Finding your site means being in the visible top spots of Google. Keywords and content go hand in hand here. We”re not talking about keyword stuffing but to make sure your content spotlights the keywords you’re using and vice versa. If you have a plumbing company then you want the content to focus on everything plumbing at the basic level and then the specialized brand name of your keynote services. The location is also a plus via Local SEO. The content from graphics to the video has to match the keywords and you can glean even further keywords from any content you create. For example, let’s say you’ve website about raising rabbits. You know people looking to buy rabbits are going to search for that. You don’t just have rabbits but you’ve got happy, organic food raised, white tail rabbits from Jones Valley, New York. Well, your other keywords to exploit with your content are right there. Searches for rabbits search for rabbits in New York, and so on. Keywords are both grown and made. It’s up to the smart website manager to notice and exploit them. You’ll know what content and keywords are working via your statistics data. You may score high for something intended like ‘where to buy rabbits in Jones Valley, New York’, but then you may notice a few thousand hits for the search query ‘Where to buy white tail fat rabbits?’. Well, there you see that a specialized search found such words on your site’s content. This now makes them keywords. Even more precise is what if you had a video of you showing off your rabbits at the annual local parade. Well, if the parade is that important, other people will be searching for its name and lo and behold they find your site at the top of the search pages. Why? Because all the people at the parade who visited you and engaged with you went home and put that information on their social media pages. So let’s say you met a hundred people who played with your rabbits, 80 of them have put up content on the web with your name and established keywords and with a link to you. Google will notice something like that as it says that your site is the focus of public interest to a degree and that is money in the bank. Remember, it’s the quality of your content that will make the day. You need to be observant and practical in all ways. This is because opportunity can spring forward from whatever content you have but you need to be on your toes to not only notice it but to act on it. When all these things come into play you’ll see the results in your stats and bank account. Finally, the best thing to say is that keywords are content and content are keywords. Knowing how to make the best of them calls for attention, skill, and Google’s algorithms. Next PostNext How Much Does SEO Cost?